Going into the finale tonight, I once again asked myself if I was glad that the writers had brought Tony back at all. From the initial giddy excitement of his return and the possibilities I thought came with it to these last weeks of ever-dimming hope that his involvement would be justified by the story and the many questions surrounding it would be addressed, I’ve wrestled with this question for awhile. Even now, with the show over and done with (again) and knowing that we may never see Tony on screen again, I can’t answer it. It’s very clear that bringing him into this season was a cheap ploy by the writers to attract fans of the original series to this new venture. It was successful, at least in part – I know I wouldn’t have watched otherwise. The elements of this season that intrigued me were FAR outweighed by the tired tropes that may have made for gripping storytelling ten or fifteen years ago, but are obsolete and at times downright offensive in this day and age. The “twists” were predictable, and the characters are largely variations of the same archetypes we’ve gotten to know over nine seasons and a movie (not to mention countless other franchises by now). Rebecca was the one character besides Tony that I developed any real investment in, for two reasons: one, her purported history with Tony, and two, I’m a predictable fangirl with a weakness for morally-grey women in power. And I will say this – if they were going for shock value when they decided to kill her tonight, they succeeded as far as I’m concerned, because I honestly can’t believe that yet again they killed off a female character to service male storylines. Even after all of this – after a season that has missed virtually every storytelling mark – I couldn’t believe that they would be that blatant, and right up until the final clock I was waiting for it to be revealed that her death had been faked. Which brings me back to Tony. For one shining moment, I thought I saw where the story was going, and it was almost enough to make up for how criminally underused and underserved he has been this season. 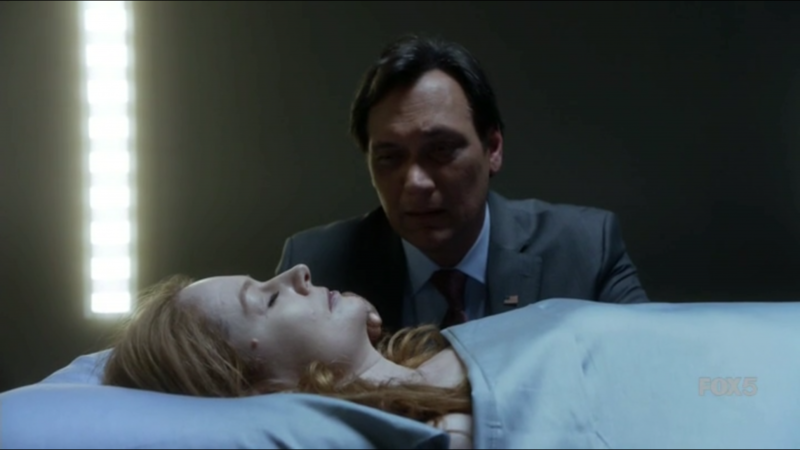 Tony, who disappeared when he learned that Rebecca was still alive; Tony, who helped Jack fake his own death in Season 4, then kept his own living status a secret for three years; Tony, adrift, with no real place in the world and showing no attachment to anyone or anything besides Rebecca – Tony was going to help her fake her death. That’s how the season was going to end, with the two of them ghosts in the wind, living with the choices they’d made, and an ambiguous hope that maybe they could right some wrongs. It all clicked. Then, of course, the commercial ended, we saw Rebecca’s body on a slab twelve hours after being shot, and Tony never returned. OMA, I totally get where they are going with this and it might just make the whole thing worth oh damn nevermind. I had so many questions after his first episode. How had he escaped/been released from prison? How did he meet Rebecca? What forged a connection so strong that she never told CTU that he was alive after season five? What kept that connection alive to the point that she worked with him even after his (presumed yet inexplicable) release from jail? And you guys, I was so excited to get answers to those questions. I couldn’t wait to see how he had evolved, and what role Rebecca – who, against my will, I was becoming quite fond of – had played in that. I understand that the original plan was to reveal more details about how he was free, what he’d been up to, and what his relationship with Rebecca was. Whether those scenes were written and never filmed, or were filmed and then cut, I’m not sure. I do know that whatever the answer is, it’s unacceptable. Back in the day, we used to spend hours on this site each week analyzing every moment and nitpicking every detail; that wasn’t the case this year, and these aren’t nitpicky questions. These are fundamental pieces of a story that were dropped in favor of – what? What storylines, what scenes, were more important than giving the bare minimum of an explanation as to how and why a character that has existed for over 16 years is where he is? It’s offensive to longtime fans of the show to ask us to believe that a character last seen serving a life sentence in solitary confinement is now freely traveling the world as a gun-for-hire and working in some capacity with CTU agents without a hint of an explanation. As the weeks went by and it became clearer with each episode that we wouldn’t be getting satisfying answers to these questions, I hoped that we’d at least get a good storyline and maybe the start of a redemption arc for Tony. Nope. He spent a few episodes torturing a man, served as a plot device to allow CTU to track Rebecca, and then tried to kidnap a ten year old girl with no regard for her safety because it was the job he’d been hired to do. If I had trouble accepting that Tony would risk innocent lives in Season 7 in an effort to avenge Michelle, it’s even more unbelievable that he’d deliberately place a child in harm’s way for money. In season three, Nina Myers played a role similar to the one Tony played this season, at least on the surface: both were fresh out of prison and working off the grid for whoever would pay them. This parallel could have been fascinating if it had been explored and if the writers had been conscious of the critical difference between the two characters: every crime Tony committed, every mistake he made, every bad decision that led him down the path he’s on now, was rooted in emotion. He committed treason to save Michelle’s life, and again to avenge her death. The last time we saw him in any significant scene was at the end of season seven; he was sobbing and spitting with rage as he was hauled off to prison. It is unfair and lazy to jump from that to the man we saw this year. He isn’t Nina. He isn’t Jack, either, who – like Nina – put his job ahead of everything else in his life, and paid his own price for it. We saw a hint of Tony putting his heart before his head when he helped CTU find Rebecca, but the character we saw this season was, for the most part, unrecognizable as Tony Almeida; he was merely a plot device, a ratings ploy. The lack of attention to Tony’s character this season was just painful. Yet I can’t say that I wish they hadn’t brought him back, because selfishly, it has been fun reliving those old days. Tony didn’t get a great redemption arc, or a storyline at all, really, but he’s no worse off than we last saw him; he’s still out there, and there is still an odd sort of possibility attached to that. Even if his pitiful final scene tonight is the last we ever see of him onscreen, there’s still potential that lives on. Not with the writers, the actors, or the showrunners but with us, the fans – the potential for us to fill in the gaps, and to create our own ending. The potential to ascribe a better and more believable future to Tony Almeida, one that honors and respects the history that we’ve shared with him in a way that 24: Legacy failed to do. So that’s what I’ll take away from this ill-advised venture. It’s been a frustrating letdown of a ride. The character, and the audience, deserved better. But Tony’s legacy goes way beyond the crumbs we were served this year, and it’s in our hands now to shape and define as we see fit.